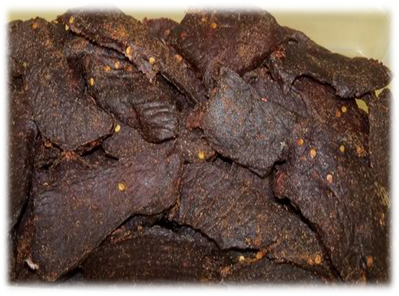 Most people assume a food dehydrator is the only modern way of dehydrating deer meat in order to make jerky. However, we actually prefer combining the smoking method first and then dehydrating the deer jerky in order finish cooking it. Smoking the deer jerky for 3 hours before putting it on the dehydrator will add a smoky flavor that can't be achieved with a liquid smoke seasoning. The key to smoking deer jerky is trying to keep a low temperature of 140-160 degrees which is a similar temperature that you will use when putting it on the dehydrator. If you are looking for a convenient method of making this deer jerky recipe, just substitute a store bought package of seasoning mix for all of the seasoning ingredients below. Since store packaged seasoning is fairly bland, we recommend adding the spicy ingredients of paprika, crushed red pepper, and hot sauce to whatever you buy to give your deer jerky some added kick. Just like marinating chicken before you put it on the grill, mix all of your seasoning ingredients and deer hamburger in a large bowl and let them sit in the refrigerator for up to 12 hours. This isn't a requirement if you don't have the time, but it will improve the flavor of your jerky. We recommend preparing this the night before you want to make your jerky. Light your smoker and let it come to a low temperature of 160-180 degrees Fahrenheit. Remember that most meat you smoke is typically 200-225 degrees, so make sure you turn down the smoker or use less charcoal. As your smoker heats up to temperature, take your deer hamburger meat bowl out of the refrigerator and start to strip out it down into smaller pieces for smoking. There are numerous methods for making your deer meat into strips but the easiest method is to purchase a deer jerky gun that you can simply shoot out strips automatically. The next best method for making deer jerky strips is to use a rolling pin and cut strips to about 1/4 an inch thick by 1 inch wide. Next, add a smaller amount of smoker wood chips than normal. We recommend about a hand full every hour for the 3 hours your jerky will be on the smoker. Rub some olive oil and cooking spray over the smoker grate and lay out all the strips evenly on a single row. Do not stack the strips on top of one another. If you are still afraid of the jerky sticking you can also put the meat in a foil pan to help pull it off the smoker easily. After about 2 1/2 hours turn on your dehydrator to get it warmed up. Smoke the jerky for another 30 minutes (3 hours total) and pull the grill grate off using hot pads. Bring the grill grate into the kitchen where you have your dehydrator warmed. Line your dehydrator with the deer jerky meat and keep it in the dehydrator for another 5-6 hours. This timing will depend on a number of factors, so just make sure you check your jerky before pulling it off. To check it for doneness, let a piece cool, then bend it in half. It should be pliable in the center but the edges should break off.